Maintaining a clean keyboard seems like a simple enough task. Here are a few tips for helping to clean and maintain your MacBook keyboard. Like with any appliance or tech, routine maintenance on your MacBook keyboard goes a long way. Make a few passes at taking care of your MacBook every six months or so, and it will pay off in the long run. Compressed Air is the recommended way to clean your MacBook keyboard, as well as the Mac and it's accessories. Before you spray down your MacBook, turn it off and unhook anything that might be plugged into the USB or other ports. Additionally, make sure any keyboard covers have been removed. With your MacBook open, hold it at roughly a 75-degree angle so the keyboard is almost vertical. With a can of compressed air, spray the keyboard. Move in a zig-zagging pattern from left to right to help jar loose any dust or crumbs that may be caught in the keys. Turn the computer 90 degrees so the Tab and Caps Lock keys are at the top. Repeat the same zig-zagging motion with the compressed air, again moving from top to bottom, left to right. Rotate the MacBook and repeat the process one last time, with Tab and Caps Lock on the bottom. Finally, run a lint-free, microfiber cloth over the surface of the keyboard to wipe off anything that was knocked loose, but not removed from the keyboard. Microfiber cloths are inexpensive, can be used for a variety of cleaning tasks, and can be reused after washing. 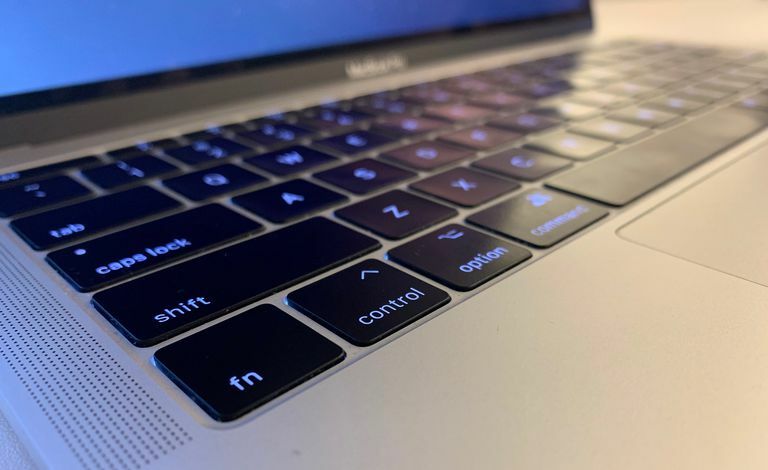 If you have stickiness or built up residue on your MacBook keyboard, you might need a little more deep cleaning to take care of it. Your two best options are cleaning slime or rubbing alcohol. There are brands of cleaning slime specifically made for tech products. Gently press the slime down on the keyboard and pull it back. If done correctly, it will bring huge amounts of grime up with it. Just like when using compressed air, make sure your computer is powered down and everything is unplugged from it before starting the process. If there's something stubborn stuck on a specific key, rubbing alcohol may be your best bet. Add a few drops to a cotton swab and apply to the offending areas of your keyboard. Make sure the rubbing alcohol does not seep underneath the keys. Keep it on the surface of the keys only. If your keyboard is still having issues even after utilizing these cleaning methods, there is probably something bigger to worry about in there. Make an Apple Genius Bar Appointment and take your MacBook to a local Apple store, or check online about getting it repaired if there are no Apple Stores nearby. Check to see if your MacBook is still under warranty, too. If it has serious issues, it may need to be sent in to get repaired.